The Toronto Argonauts announced Wednesday the club has signed International DE Tobi Antigha. Antigha, 25, is coming off his second CFL season with the Saskatchewan Roughriders after playing in 17 games in 2018 and racking up 21 tackles, two sacks, and three interceptions, one of which was returned 52 yards for a touchdown. The Florida native played all 18 games in his 2017 rookie season and finished with 40 tackles and five sacks. The 6'2, 240-pounder played 39 games over four seasons at Presbyterian College in South Carolina as a receiver. How about Collaros, glen, lulay and ray. And pay them each $ 175,000. Maybe we can get through 18 games, Oh Durant to . Split that 5 ways. Collaros is our best option for now whether we like it or not. But the number 2 position will be as equally important and hopefully we can get a number 3 guy to move up the ranks. I guess Ballsy will have to find another man crush. I was hopeful Jennings would come to Sask. but not to be. With all due respect, the Rider brass has to go into development mode, no point in latching on to retreads to 'patch' through the season. I am not convinced waiting for Streveler is the answer, or really anyone in the league right now for that matter. I am sure Jeremy and Paul will unearth some quality guys with an upside, and work with two years down the road for the program to bear fruit. And sorry, no way Zach makes it through the season unscathed, he is a marked man behind an average O-line. We should have made a play for Sir Vincent at the very least. Tobi Antigua left town for bright big city lights of Toronto. Where are you getting this "average OL" idea from? Our OL struggled early in the year due to a lot of injures but by the end of the year we were tied for the league lead with the fewest sacks, and we were second in the league in rushing yardage, and and we improved our OL a lot late in the year with the addition of Blake. I still think it's important for us to sign St. John, however, and hopefully Shepley as well. IF we do that we might even be able to go to 4 Canadians on the OL. And no, we are absolutely NOT in QB development mode right now. We were second in the league last year and we are in win NOW mode. Developing your own QBs is a "would be nice" thing these days rather than a must have in any event. Most starting QBs in the league are not with the teams that brought them into the league. Manziel was not brought in by Montreal. Jennings was not brought in by Ottawa. Franklin was not brought in by Toronto. Massoli wsa not brought in by Hamilton. Nichols was not brought in by Winnipeg. Harris was not brought in by Edmonton, and Collaros was not brought in by US. On Mitchell and now Reilly, who was brought into the league with by the Lions before being traded to Edmonton, where he became a star before going back to BC this year, are with the teams that brought them into the league. So no, developing your own QBs is not a critical thing at all. Now you're thinking Randolph. You have the right idea. The Big 3 are in multi-year deals so won't be on the market next year. Collaros' deal is done next year & who do you get? Jennings is on a 1 year deal, Franklin comes available as does Streveler but, if he's good he's young enough to try his luck down south as is Franklin. If they're no good moving to a new team doesn't solve the problem. If Streveler shines, they can always go with him as #1. Don't expect someone else to solve your problems for you. You've been doing that for 3 years now. You had 2 future HOF QB's - that didn't work. Then you paid for Collaros who's best years were 3 years behind him. Durant & Jones were supposed to be the ticket to a Grey Cup but Durant 2016 was not DD 2013. You've tried recycling guys for 3 years & botched the job developing Bridge. Why bring him in last year if you weren't going to trust him with a game plan other than throwing dump passes? Get somebody in with potential & develop him. If you think Watford has potential, give him some meaningful playing time behind Collaros this year or get someone you trust will take you someplace. I've heard a lot of big talk about every 3rd string QB coming here under Jones like Marquise Williams, & the list goes on & on, being the next big thing. And they sit on the bench. If you scout them & think they're good, play them. The chances of the Riders winning a Cup this year, unless some drastic moves are made which we haven't seen yet are extremely slim. 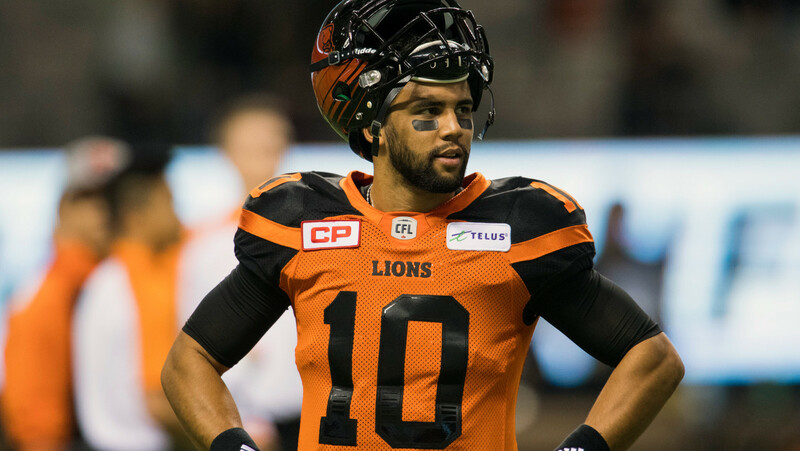 Why waste your time paying Lulay or Ray to back up for a year? Makes no sense. Hmmm... Marquise Williams, he's doing just fine down south developing in the Alliance of American Football League. Great return to any team who signs him in the future.